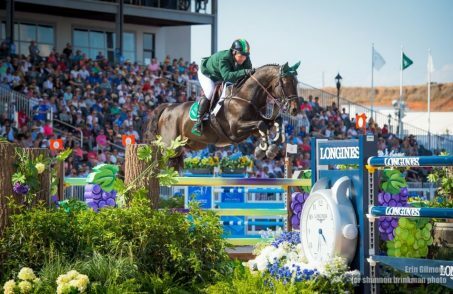 Ireland’s Cian O’Connor and the 12-year-old stallion Good Luck have finished 13th in the individual Show Jumping final, as the 2018 World Equestrian Games have come to a close at North Carolina in the USA. The pair were in sixth place heading into the final two rounds of jumping, where two fences down in the first round saw them miss out on a place in the final round by just one place. O’Connor had played a key role along with Shane Sweetnam, Paul O’Shea and Shane Breen on the Devenish & Underwriting Exchange Irish team which missed out gaining Olympic qualification by just one place in Friday’s team final at the Games. Ireland will have two more chances next year, at the European Championships and Nations Cup final, to qualify a Show Jumping team for the 2020 Olympic Games in Tokyo. Germany’s Simone Blum with the 11-year-old mare DSP Alice are the new Show Jumping World Champions – taking the Gold medal as the only combination to jump clear in all five competitions this week at The World Equestrian Games. Switzerland’s Martin Fuchs takes the silver with Clooney, while another Swiss rider Steve Guerdat takes bronze with Bianca. Meanwhile back in Europe, Waterford’s Peter Moloney led an Irish 1-2 in today’s Jack Dodd memorial 1m50 Grand Prix at Bonheiden in Belgium. Moloney partnered d’Atlantique Royale to victory just ahead of Offaly’s Darragh Kenny who finished second with Balou du Reventon.